Step 1: Slice the mozzarella. Step 2: Slice the tomatoes in as much slices as you have mozzarella slices. Step 3: Spread the pesto on one side of the mozzarella. 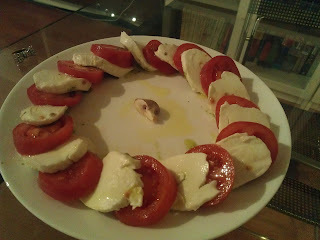 Make sure that when you lay it on a plate that the pesto side of the mozzarella is on top of the tomato. Step 4: Add some Olive oil. You can also add salt and peper depending on how strong your pesto is. And if you like to you can also add Basilicum, I sometimes do but this time I liked a mushroom better. I love to eat this as starter especially when I'm eating Italian food like spaghetti.